Coach Justin Blood has used his years of pitching experience to fine tune a program that can help pitchers reach their full potential. In this comprehensive DVD, Coach Blood will demonstrate the implementation of a daily routine that will help to build a successful pitching staff and reduce the chance of injuries. Among the topics covered are: fastball command, the throwing program, drills, flat ground work, pitcher's fielding practice, thera-band and small weights, conditioning, bullpen routine and additional pitching tips. This DVD is a must-have for every pitching coach and pitcher. 99 minutes. 2013. About the Coach: Justin Blood is the head baseball coach of the University of Hartford Hawks. He comes to Hartford by way of the University of Connecticut, where he served as the Huskies pitching coach and recruiting coordinator. In his six seasons with Connecticut, Coach Blood had 14 different pitchers drafted in the Major League Baseball draft. A pitcher himself, Justin Blood was drafted by the Seattle Mariners in 2001 and excelled in the minor leagues before retiring to pursue coaching on the collegiate level. Coach Ray Birmingham has used his years of coaching experience to fine tune a program that can help hitters reach their full potential. In this informative DVD, Coach Birmingham will demonstrate several keys drills designed to create better hitters. Among the topics covered are: basics of opposite field hitting, mechanics of the swing, pull hitting, teaching bat lag, the pitching machine, self toss drill, using the tee, the swing stick and tips for batting practice. This DVD is a must-have for every baseball coach and player. 2017. About the coach: Ray Birmingham is the head baseball coach of the University of New Mexico Lobos. His teams consistently rank in the NCAA top 10 in the hitting category. Prior to coming to UNM in 2008, Ray was the head baseball coach at New Mexico Junior College in Hobbs, NM for 18 years and at the College of the Southwest in Hobbs, NM for 2 years. In 2011, Ray Birmingham was named a member of the National Junior College Athletic Association Hall of Fame. Birmingham also served as the hitting coach for USA Baseball's Collegiate National Team. Several players that were coached by Ray Birmingham have gone on to play Major League Baseball. Coach Rich Maloney has used his 23+ years of head coaching experience to fine tune a program that can help infielders to reach their full potential. In this comprehensive program, Coach Maloney demonstrates the implementation of numerous skills and drills designed to develop the most important aspects of infielding. Among the topics covered are: footwork, tag plays, hops, phantom drills, double plays, flips, throws, various fielding drills, slow rollers, rundowns and much more. 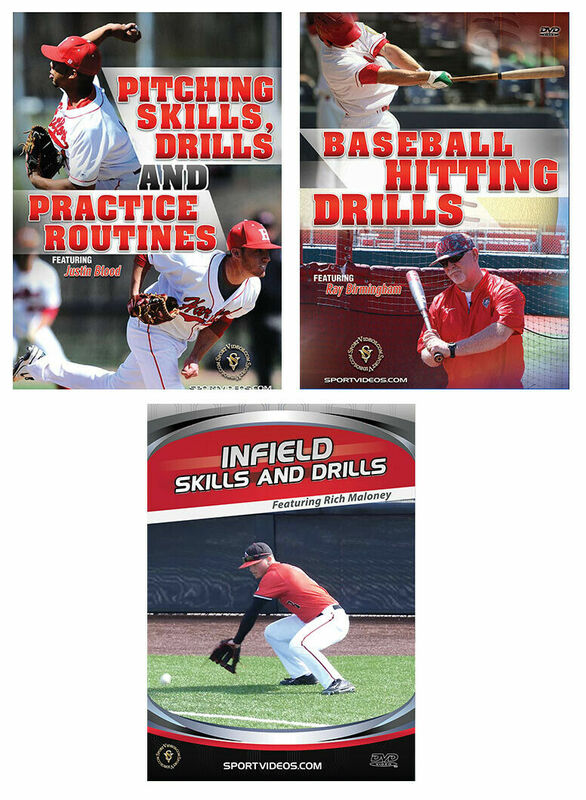 This DVD is a must-have resource for every coach and infielder. 89 minutes. 2019. About the Coach: Rich Maloney has been the head baseball coach at Ball State University in Muncie, Indiana since the start of the 2013 season. He is the former head coach of the Michigan Wolverines where he compiled a record of 341–244 in 10 seasons, from 2003 to 2012. He led the Wolverines to four consecutive NCAA tournament appearances (2005–2008) and was the Big Ten Coach of the Year in 2007 and 2008. From 1996 to 2002, he was the head coach at Ball State. He was named the Mid-American Conference (MAC) Baseball Coach of the year in 1998 and 2001. From 1998 to 2001, the Cardinals finished first in the MAC West for four straight seasons. Coach Maloney has been a member of the American Baseball Coaches Association (ABCA) for over 28 years. He recently finished his term as President of the ABCA.